The ‘Reno Effect’ is a sort of condition that states, “if your deck contains no more than one of each card, do X’. Before the expansion, all we had was Reno Jackson himself. Now, however, with so many more being announced, let’s take a look at whether or not they’re worth running. Coming first, it’s Inkmaster Solia. Honestly, this card is underwhelming, and has a sub-par effect with such a huge condition needing to be met. It’s not good for the reason Cho’Gall isn’t any good, because at 7 mana, why not just cast the spell instead of sacrificing something huge just for a little bit of tempo? Also, there are few at best spells that cost 7 mana or more that Mages are running to begin with. All in all, I predict that this will see little to no play at all. 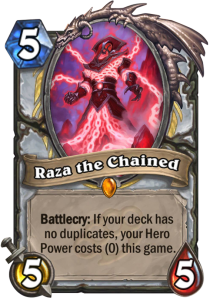 Raza the Chained is a little more interesting. A 5 mana 5/5 is on curve, and the effect allows you to get a good amount of healing in on literally every single turn, as there’s no reason not to be using it. If used with Justicarr Truehart, that’s a beefy 4 health heal per turn on a target of your choice, or dealing 2-4 damage to an enemy if used with Aucheni Soulpriest. This one’s not particularly insane, but it certainly has its place in Reno Priest, assuming that sort of a deck comes around. 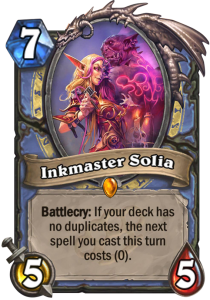 Overall, it’s not top tier, but it is certainly much better than Inkmaster Solia. These cards are interesting, especially being released when they are. Their intention is obviously to be used in Reno decks, so that the additional healing from Reno Jackson can occasionally also yield something else from these minions, but their individual effects are just not good enough to build a deck around by themselves. The reason this becomes a problem is because Reno and the rest of the Adventures Guild card rotates out in just over a year – will these cards prove to be so good that their effect is worth ‘reno-ing’ your deck for, or will Reno’s rotation out of Standard kill their usage? Feel free to discuss below!